Firstly, let me begin by saying it’s Cap-ah-doe-kee-ya. I hate reading words and not knowing how to say them. Like the town we’re staying in – Goreme. Which I’ve only just worked out is ‘Gor-eh-meh’, not Gore-eem or Gor-eh-may. Urgh. Turkish is not so easy. Fortunately, language aside, the country seems to be about as well set up for ignorant tourists as Thailand and people here speak many languages. Like our hotel manager who speaks Turkish, English and Japanese (and that’s just what I’ve heard) and our tour guide who spoke Korean as well as English and Turkish. Being monolingual overseas is always a bit embarrassing… I think I’ll start telling people I speak a bit of Swahili – they’ll never be able to test me! 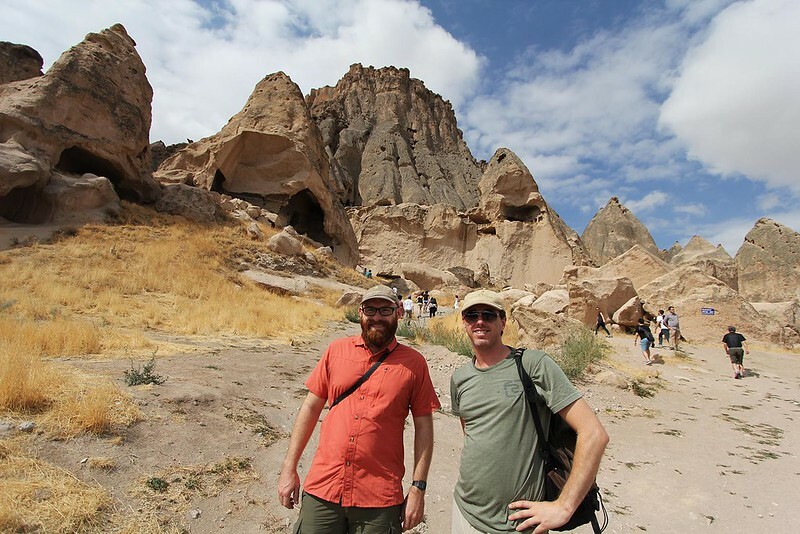 But back to Cappadocia. I wanted to come because our friend, the delightful Ms Muppet, recommended it so highly and she was right – this place is like some kind ‘Labrynth meets fairyland in the desert’ landscape. The photos will tell it best. Unfortunately Luke has now come down with the same sickness I had and spent the day on the bus suffering greatly. I felt a bit sorry for everyone else.. there’s nothing like being forced into a confined space with people who are coughing and spluttering (I’m still a bit sick too) while you’re on holidays and really not wanting to get ill. I tried to save my great, honking, nose blowing for outside the bus but… well, it wasn’t pretty. What else wasn’t pretty was me having a panic attack at our very first stop. We were scheduled to visit an underground city and I didn’t really have any qualms. We lined up, went down a narrow flight of stairs, turned a corner and some part of my brain screamed ‘GET OUT OF HERE’ and I muttered ‘I can’t do this’ to Luke, back up and raced out towards the light, adrenalin racing, almost bursting into tears. I have no idea where this comes from – I’ve never really enjoyed confined spaces or caves but I think the super-narrowness, and knowing we’d be going down 8 floors just triggered something primal and I could barely hold it together to get out. At least I know to avoid those situations in future! I spent half an hour sitting on some grass, patting a dog that, apart from being white rather than black, was the spitting image of my dog, and generally cursing myself for being a wuss. Everything else we did was fine though. We went for a walk down and along a canyon, had a nice lunch by a river, climbed to some fairy chimneys and saw the landscape that inspired Tatooine in the first Star Wars movie (scenes eventually filmed in Tunisia because the Turkish government at the time was monumentally short-sighted and didn’t give them permission), saw some epic views over landscapes that have barely changed in centuries and just generally soaked up the foreign-ness of it all. Near the place that inspired Tatooine. When we got back to the hotel Luke fell into bed and Lucas and I stayed up blogging, got some dinner and were serenaded by the sound of dozens of cars honking their horns because a wedding party arrived here and then left. We told the hotel owner that people only honk their horns in Australia when they’re angry and he laughed. “Cultural differences!” – yes, and thank god we live in a place where if you’re happy and you know it you don’t make a huge amount of noise. 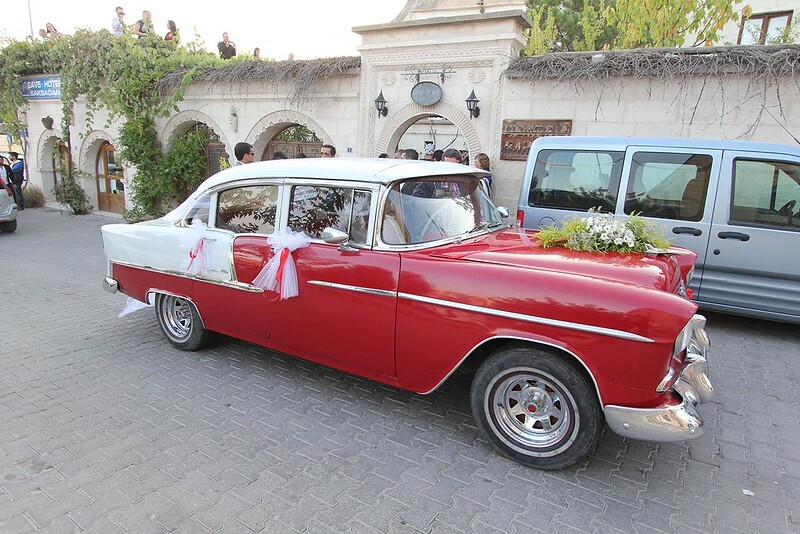 Apparently there are many weddings here on the weekends – it’d drive me mad! Speaking of our hotel, we’re staying in a fairy chimney – our room was carved out of a cone-shaped spire of rock. Pretty neat! This is what the hotel looks like. I think the first room photo that comes up on their header is our room. We had a big terrace in front of our room and one morning I counted 25 balloons in the sky. sometimes there’s over 60! Do hope that you are all feeling better soon, it’s miserable to be on such a wonderful adventure but not feel up to enjoying it. 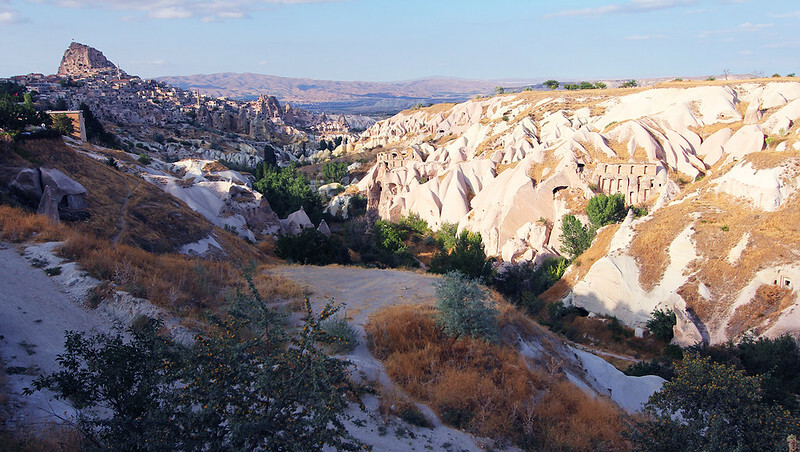 Cappadocia is such a magical land, it deserves to bethe star of a children’s story book! We’re recovering fairly quickly, fortunately. Our coughs and sniffles aren’t enough to keep us from enjoying ourselves, although the overnight journey from Göreme to Antalya has worn us out! Hopefully we’ll be back up to snuff within a week. 🙂 Lucas is still illness free – luckily he wasn’t sharing our room in Göreme. We’re all sharing one in Antalya now, though – hopefully we won’t infect him! This looks gorgeous!! Sorry about your illness and panic attack – they’re not very nice to deal with. Hope you enjoy the rest of your trip! Heh, not nice… but at least I realised when there was an easy escape route! It was heartening to learn that it just got narrower and darker further down so I made the right decision. As to illness – we’ll have an immune system of iron when we get home! Forward a link to anyone you like! This blog is very much written with public viewing in mind and I always have an eye on the stats page and get a kick out of more readers:). This blog also shows up on WordPress’ topic searches so we get completely unknown people commenting occasionally too. Thanks for the appreciation! Does your sister-in-law doing any online writing? So much simpler! Everyone here is super friendly and laid-back… I just wish you’d all stop putting so much delicious food in front of me – I have no idea how Turkish people manage to avoid becoming the size of houses! I had a panic attack half-way up a very narrow, very dark spiral staircase in Utrecht. Despite knowing that if I could just keep going it would open out onto the roof I couldn’t make myself move. I froze to the spot and had to be helped back down. It hadn’t happened before and hasn’t happened since, but like you I’ve learnt it’s best to avoid small, dark, airless confined spaces, which is a shame as the underground city sounds AWESOME! We took photos and video, so she hasn’t missed out completely – but there was some seriously small and dark tunnels to navigate. There’s also several groups down there at a time, so sometimes you have to wait in bent over, awkward positions – or in small alcoves – for traffic to clear. For major thoroughfares there were guards who would do a call and response to ensure the way was clear before letting groups proceed down or up a tunnel. For some of the smaller, unguarded tunnels though, I couldn’t see how people who might be about to go down would be able to see that there were people trying to come back up… trying to reverse would have really sucked! Definitely not an activity for anyone who is even mildly claustrophobic. Glad I’m not the only one! And smart people, those Peruvians;). Ha, miss you too! Hope you’re feeling better and some kind of homework fairy has been visiting you in the night… time to put out some milk cookies and 2b pencils? Yeah, adrenalin sure is a mysterious and scary thing. These days our ‘old brain’ so rarely takes control that it’s scary when it does. At least, as you say, there were no lions – those days are behind me;). Wooooooo!!!! Glad you enjoyed it 🙂 I spent about 5 days there just exploring…I think I did a tour (if that’s what you did) similar to yours, but then just wandered around the park/landscape/whatever it officially is. I stayed in a fairy chimney too, at the end of a corridor that narrowed up to a tiny door. I felt like I was Alice in Wonderland.